With worldwide demand for energy growing, fuel prices rising, and the effects of climate change and pollution becoming more devastating, the development of cleaner and cheaper sources of energy is an absolute priority. Solar power, produced by capturing and converting sunlight into usable electricity, is the fastest growing source of energy in the world and, for the last couple of years, has already reached a point of being cheaper than the electricity sourced by households and businesses from local utilities. Solar power is unique because it is cheap as it is clean; not only does it lower and stabilize electricity costs, it also produces zero carbon emissions and zero pollution. 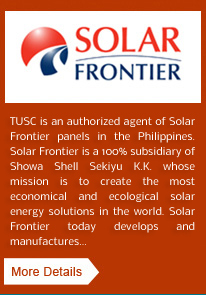 In the Philippines, Transnational Uyeno Solar Corporation (TUSC) is at the forefront of harnessing the power of the sun to meet the country’s rising energy demand in an economical and environmentally sustainable manner. 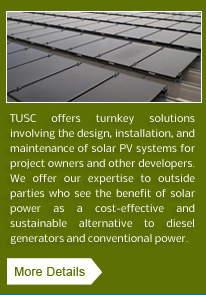 As one of the country’s leading solar photovoltaic service providers, TUSC actively works with organizations and individuals who share the same goals. One such organization is Rustan Coffee Corporation (RCoC), authorized licensee of Starbucks Coffee in the Philippines, which is one of the world’s foremost eco-conscious companies. RCoC has taken a significant leap forward by investing in a solar power system in its store at St. Charbel Village in Quezon City. Installed by TUSC in December 2012, the 20.5 kW system is composed of 84 solar panels mounted on the store’s rooftop and provides RCoC direct savings in its electricity costs by replacing electricity sourced from the local utility with power generated from the solar panels during the day. Aside from providing concrete economic benefits, this installation is a testament to the company’s commitment to the environment and the community. Given the abundant sunlight that the country receives, solar power proves to be a sustainable and practical source of energy. It presents a ready, viable solution to the energy, economic, and ecological challenges that our society needs to address with particular urgency. With the power of the sun more accessible than ever, as TUSC and RCC/Starbucks have seen firsthand, harnessing solar power is indeed a path towards a brighter and better world. 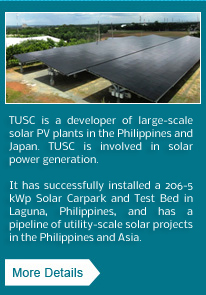 TUSC and RCoC held an inauguration ceremony on April 23, 2013 to celebrate this pioneering initiative. The inauguration ceremony’s attendees were led by RCoC President Eduardo Lopez, Jr. and RCoC Director for Store Development Carmencita “Menchu” Tantoco-Lopez. During the event, RCoC Chief Operations Officer Noey Lopez remarked that the solar installation is consistent with Starbucks’ Three Pillars: Community, Ethical Sourcing, and Environment. Starbucks has been at the forefront in building environmentally sound stores and facilities as part of its efforts to reduce the environmental footprint of its operations.